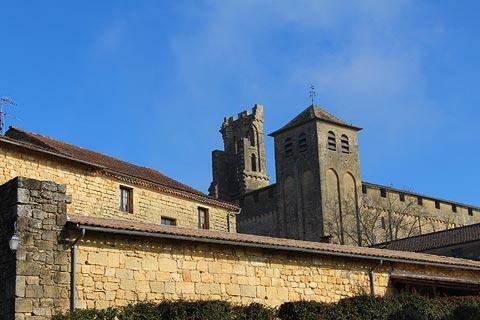 In the quiet wooded valleys of the southern Dordogne department to the east of the bastide town of Beaumont-du-Perigord the attractive countryside is very picturesque and largely undiscovered by visitors - it is here that you find several quiet villages, including Saint-Avit-Senieur. 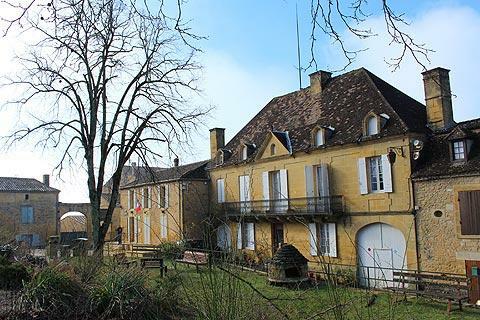 There is a small amount of parking in the centre of Saint-Avit-Senieur, but it is easier to park in the main car park a very short walk outside the village centre, direction Cadouin. 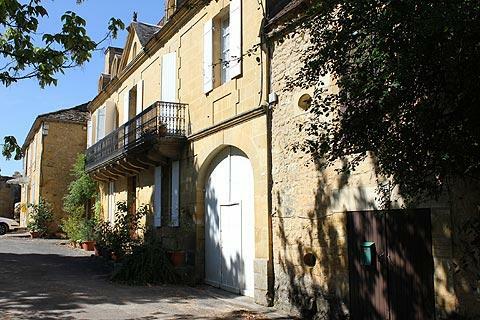 The village consists of a cluster of attractive houses in the local yellow Dordogne stone, around a shady central square in the centre of Saint-Avit-Senieur. There is also a substantial ruined abbey, the principal attraction for visitors. If you stroll a short distance along the roads that lead out of the village to the west and the south you will discover very pretty views across the countryside around the village, and the second of these two roads overlooks a broad valley where sheep are raised: quite unusual in this region. 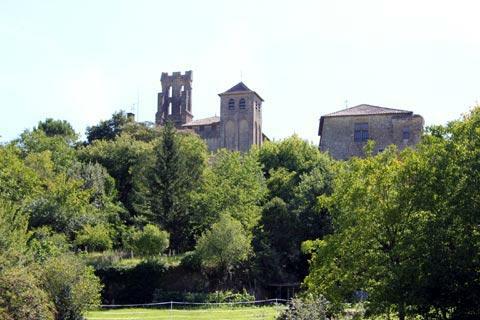 Head a little way down the hill from Saint-Avit-Senieur to see an old lavoir and a nice view back up to the abbey above the trees. 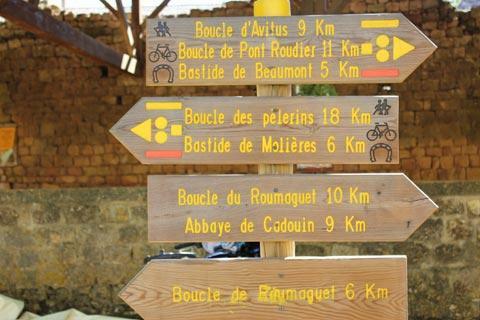 There are numerous walks and trails through the surrounding countryside - see the signpost outside the abbey church for directions (the village is too small to have its own tourist office) for some of the many options. 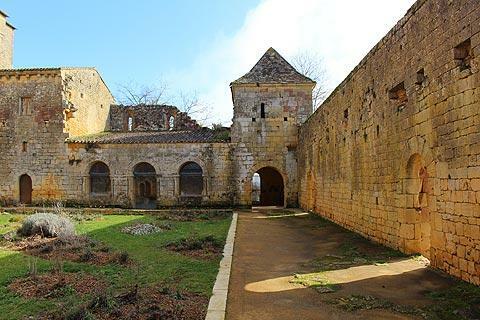 The main monument in Saint-Avit-Senieur is an ensemble of buildings that are the remains of a substantial abbey complex dating back to the 13th century, and now a listed UNESCO heritage site. 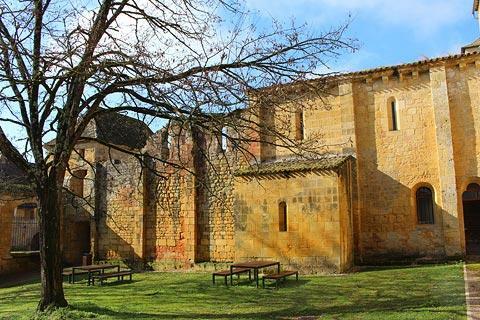 The abbey was originally constructed here in memory of a 6th century hermit (Saint Avit - then Avitus) who took refuge here, and received a sign from God when he stopped in front of a pagan temple which collapsed when he prayed in front of it. 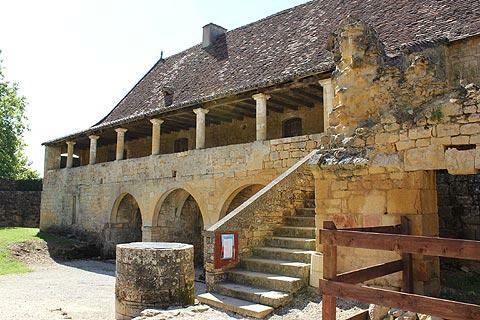 The site later became an important stop on the pilgrimage route from Vezelay (Burgundy) to Santiago de Compostella (Spain). 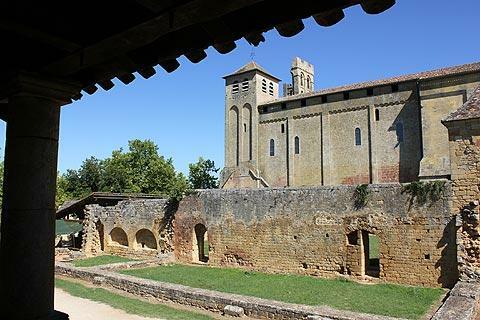 Although not all the original buildings are still standing you can still see the church, the presbytery, and the dormitory in which the monks slept. 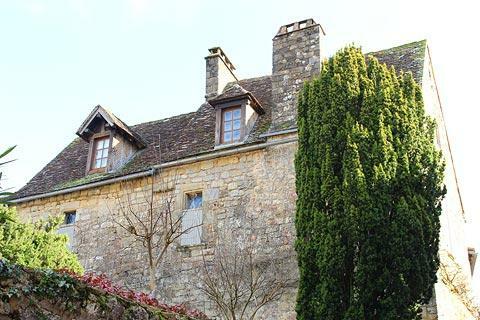 The presbytery is on two levels, the ground floor dating from the 13th century while the upper storey and picturesque balcony was added during the 17th century. 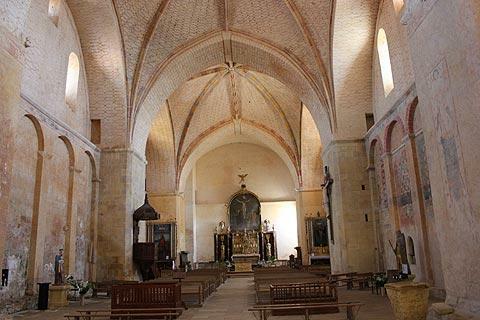 The main church is rather austere inside but note some fading frescoes and decorations on the walls. 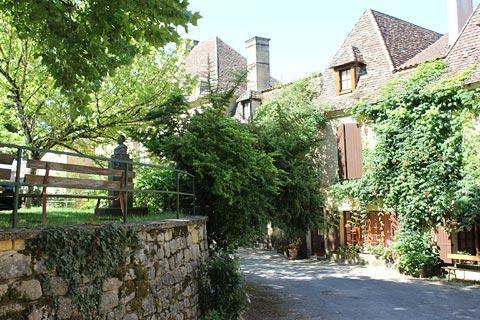 From the village you can contine a couple of kilometres down a scenic road through the valley towards Beaumont or take a small turning to the left which leads to Montferrand, another picturesque local village. 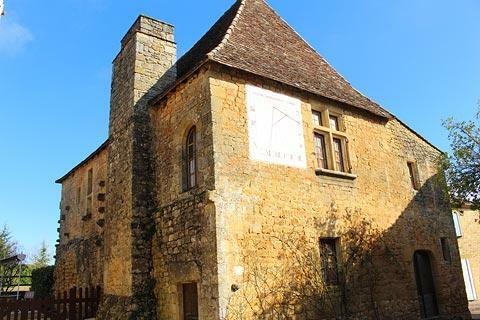 The village of Cadouin to the north-east of Saint-Avit-Senieur has a famous abbey, and your tour can also include a stroll around the small village of Molieres, a small pretty village a short distance north of here. 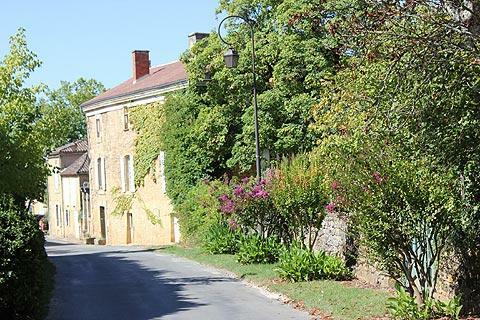 France This Way comment: none of the four villages mentioned here - Saint-Avit-Senieur, Cadouin, Molieres and Montferrand - takes very long to explore but a day or two exploring the four of them and enjoying the countryside is very pleasant. I live not far away and often pass through all of them them on a bike: it is a bit hilly but lovely cycling countryside! 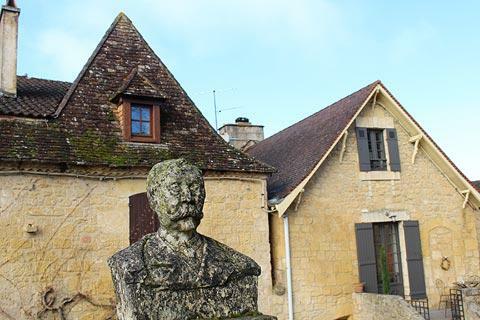 Not much further you will also want to visit Monpazier, one of the loveliest villages in France.